Talk about Fairy Dust and Snake Oil! Under Barack Obama’s economic theory, better known as Loot-and-Plunder Economics, income tax rates will necessarily skyrocket, perhaps by as much as 50% across-the-board. If you don’t believe it, just look at the facts and figures. For example, as of FY 2011, annual outlays on Social Security Benefits were 77.7% greater than they were in 2001, while outlays on Medicare were 148.8% greater (shown in current dollars in the chart above). Has Obama solved the problem through entitlement reform? Has he raised Social Security and Medicare taxes by 77.7% and 148.8% respectively? No, so what do you think is coming? While Obama talks the talk, regarding taxing the rich and fairness, surely even he knows that his plan is not sustainable. It doesn’t balance the budget or grow the economy. The truth is that Obama has no plans for lowering income tax rates on the middle-class, but instead he created Obamacare, which is a nifty way of imposing a whole new set of taxes on those who can least afford health insurance, namely the middle-class. Got it? There will be no middle-class tax relief in a second Obama term, just new health care taxes (i.e. more pain). So other than leading us all to the edge of a Fiscal Cliff, what else has Obama done for the middle-class? Well, he delivered a two-year Make Work Pay Credit (MWPC), which represented a $400 to $800 reduction in Social Security Taxes in 2009 and 2010, and followed this up with a two-year 2.0% Social Security Tax Cut. In other words, he gave us four years of temporary measures in an effort to stimulate the economy. But what did this really accomplish? #1 – The jobs deficit has grown to 11,760,000 under Obama’s watch, from 5,165,000 when Bush turned over the keys. So we can state without ambiguity that his attempts to stimulate the economy have failed. Sure, things might not be as bad as they could have been, but at the same time, things might not be as good as they could have been either. The “jobs deficit” increases every month that employers create fewer than 127,000 jobs, the number needed to keep pace with population growth. As you can see in the chart below, the jobs deficit has increased under Obama’s watch, and has remained virtually unchanged since December of 2009. 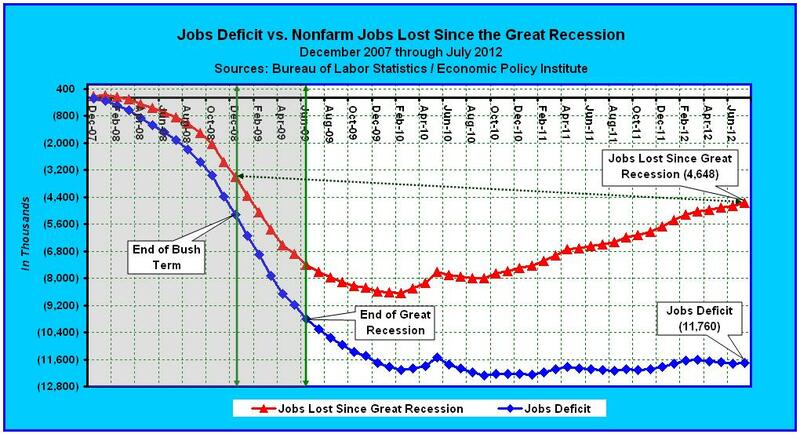 Aside from the jobs deficit, we are still 4,648,000 jobs short of where we were in December of 2007, partially due to the Great Recession, which ended in June of 2009, but namely due to Barack Obama’s loot-and-plunder economic policies, which were designed to prolong the crisis. #2 – Not only has the unemployment rate remained above 8.0% for his entire term, but Obama’s ingeniously designed Social Security tax cuts have since created a $500 billion per year shortfall in the Social Insurance Fund accounts. Per the chart below, derived from the Bureau of Economic Analysis, Table 3.14 – Government Social Insurance Funds Current Receipts and Expenditures, the gap between Social Insurance receipts and expenditures is now worse than ever, thanks to Obama. I guess we’ll find out whether or not work pays (i.e. the MWPC), a few years from now, when we discover that our Social Security and Medicare guarantees were squandered away during the Obama years. His looting of an additional $716 billion out of Medicare to fund Obamacare should be le coup de grâce (the final blow). As you can see in the chart above, the point of no return was actually breached in FY 2001, when Outlays for Social Benefits equaled Insurance Contributions. This was primarily due to an escalation in the number of baby-boomers reaching retirement age. But instead of addressing the obvious dilemma, the federal government allowed it to fester into larger and larger annual deficits. 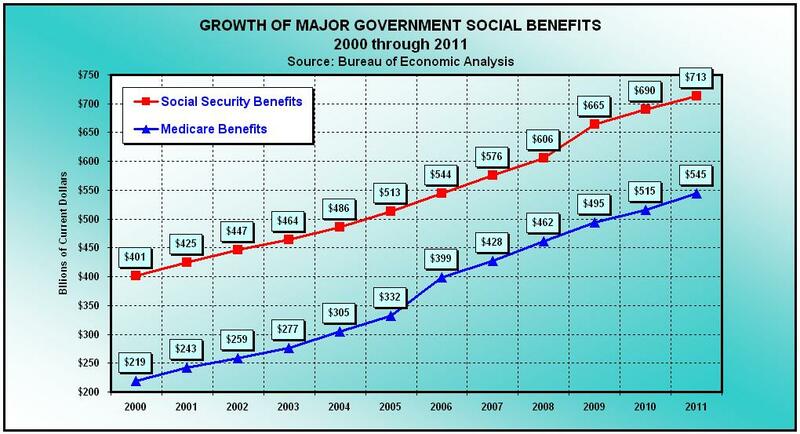 Thus, the “Social Benefits Deficit” eventually reached $177 billion by Fiscal Year 2008. Then along came Obama, who instead of addressing the problem has handed out four consecutive years of Social Security Tax cuts (i.e. loot-and-plunder fairy dust). In just three years Obama turned a $177 billion annual Social Benefits Deficit into a $500 billion per year morass. Free money! Obamabucks! What were the results? As you can see in the chart above, and in the related table, in Fiscal Year 2009 the gap between Government Social Benefit Expenditures and Contributions swelled to $376 billion, from $177 billion in 2008, or by 112.4%. Those were the consequences of giving both taxpayers and non-taxpayers a reduction in their Social Insurance responsibilities via the MWPC. In Fiscal Year 2010, with the extension of MWPC, the Social Benefits Deficit widened to $411 billion, or by another 9.3%. As if that wasn’t enough, Obama devised an even more cunning way of plundering America’s future retirement security. Replacing MWPC with his 2.0% Payroll Tax Cut, in 2011, caused the Social Benefits Deficit to widen by an additional 21.4%, to $499 billion. That’s a half-a-trillion dollar shortfall. And it’s not over yet. Since the 2.0% Payroll Tax Cut was extended into 2012, we will find out where Social Insurance Benefits stand, at the close of the fiscal year, on September 30th. But so far, when added together, $376 billion in 2009, $411 billion in 2010, and $499 billion in 2011, equals a total Social Benefits Deficit of $1.3 trillion. That’s the amount Obama has added to the national debt by tampering with our future retirement security, and that’s just a fraction of the $5.3 trillion he’s added to the overall debt. Between FY 2001 and 2008, Contributions for Government Social Insurance grew by 39.3%, while Social Benefit Expenditures grew by 73.6%. But instead of raising a red flag and solving the problem, Barack Obama proceeded to loot-and-plunder contributions, at a time when the demand for benefits was soaring. This was an amateurish move. Between FY 2009 and 2011, Contributions for Government Social Insurance actually shrank by -6.9%, while Social Benefit Expenditures rose by 22.1%, creating a $1.3 trillion shortfall. So while gullible far-left loyalists continue to fall for Obama’s pretense, that the Romney-Ryan Ticket and Supply-Side economics would gut Social Security and Medicare, if they took five minutes to look up the facts, they would discover that Obama, through his own brand of loot-and-plunder fairy dust, has already beat them to it. The snake oil Obama is pushing is the same stuff that prolonged the Great Depression. Everyone knows that the federal government didn’t end the Depression, World War II did. That is everyone except for Obama, the unlearned and a few far-left loons. What folks should be engaged in is bipartisan criticism of the manner in which Barack Obama is destroying our future economic security. We should at least be able to agree that there has to be a more viable alternative. Supply-side economics worked in the Roaring 20’s under Coolidge, in the 1960’s under JFK, in the 1980’s under Reagan, and in the 1990’s through 2007 under Clinton and Bush. That’s right! But according to Barack Obama, “It never worked.” Don’t believe that lie. 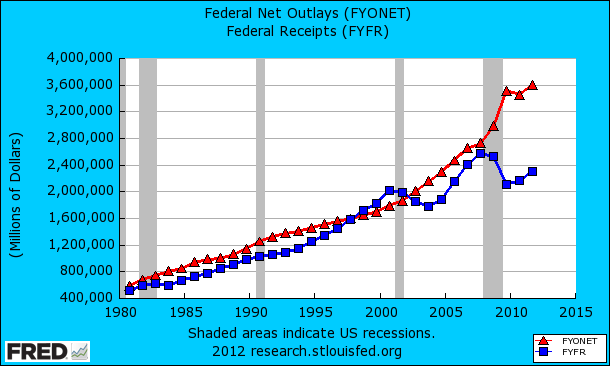 A quick glance at the following chart, Net Federal Outlays and Receipts since 1980, says it all. Trillion dollar annual deficits are a phenomenon which began with Obama. Lest we forget, Bill Clinton’s famed tax plan was a package which included tax rates ranging from 15% to 39.6% (i.e. rates were higher at all levels across-the-board), in addition to the Republican-led Tax-Relief and Deficit-Reduction Bill of 1997 (i.e. what actually created the boom of the 90’s). But if you think Obama can cherry-pick just one smidgen of Clinton’s tax policies, apply it to only a fraction of taxpayers, those making more than $250,000 (the equivalent of $157,197 in 1993), and achieve the same results, then you’re not using your brain. Loot-and-Plunder economics ends when everyone sees their taxes rise by 50% or more across-the-board. That’s the only way the federal government can continue to spend at current levels, and move even halfway towards balancing its budget. When you see the symptoms of a failed economic policy (above), and your candidate boasts, “My plan worked,” that’s when you run! 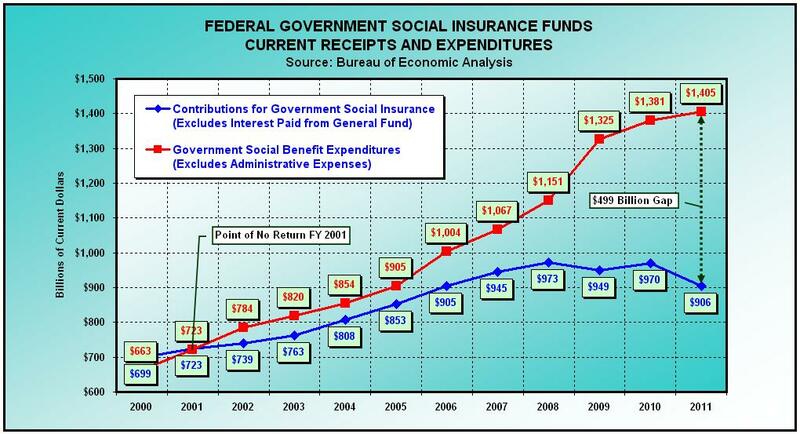 The third chart (above) purposefully excludes interest contributed towards Social Insurance, since such interest is paid from general government funds. The federal government long ago raided the Social Security Trust Fund spending every dime, and now owes the Social Security Trust Fund $2.5 trillion, per Note 24 of the United States Government’s Notes to the Financial Statements, for the year ended September 30, 2011. From time to time, the federal government pays the Trust Fund interest on its debt, but with trillion dollar deficits for the last four years, it is reasonable to conclude that every dime of the interest paid is borrowed, thus it makes no sense to double count. The chart also excludes administrative expenses.